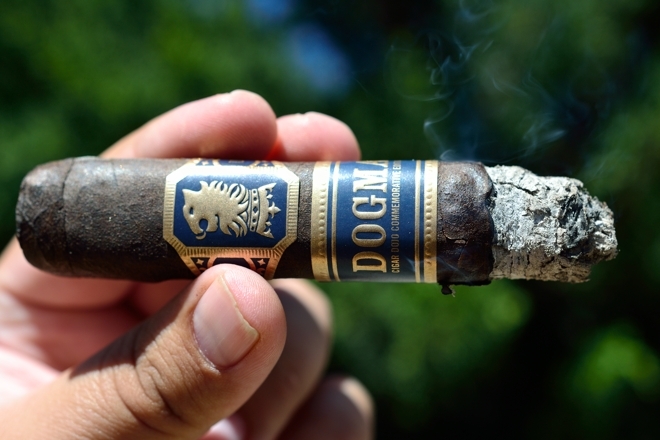 Drew Estate is releasing the newest addition to the Undercrown portfolio, the Drew Estate Undercrown Dogma. 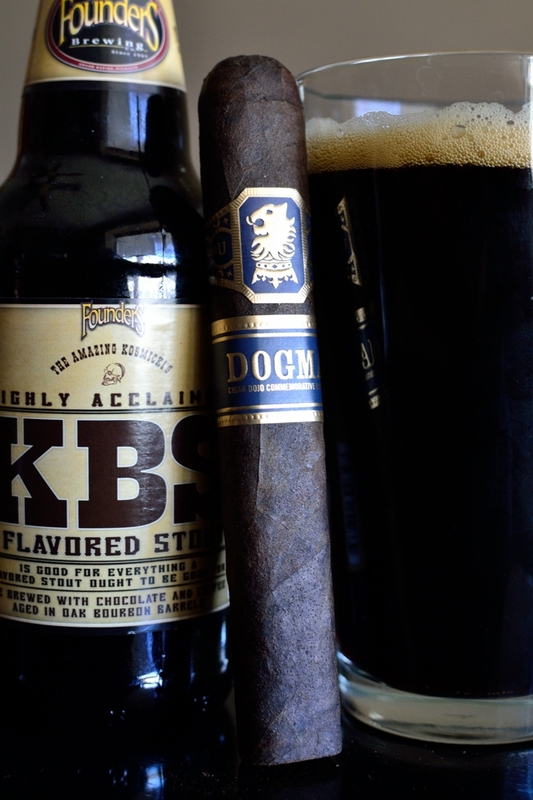 As I watch what could be Martin Brodeur’s final game as a Devil, I decided to step outside with a Dogma in one hand and a glass of Founders’ Kentucky Breakfast Stout in the other. While the initial batch of Dogma has been sold out, I am told more are on their way. You can find this here and sign up for restock notifications. Big thanks goes out to our friend at Drew Estate for shooting a few of these over. Now, let’s dive in shall we. 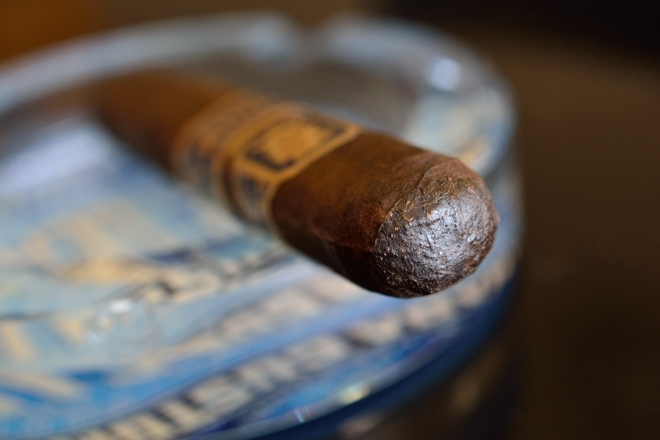 Prelight: The Drew Estate Undercrown Dogma carries a familiar wrapper, the same one we see used on all the blends in the line. It’s a very heavy, very thick, very dark leaf covered in oils and thick tooth. 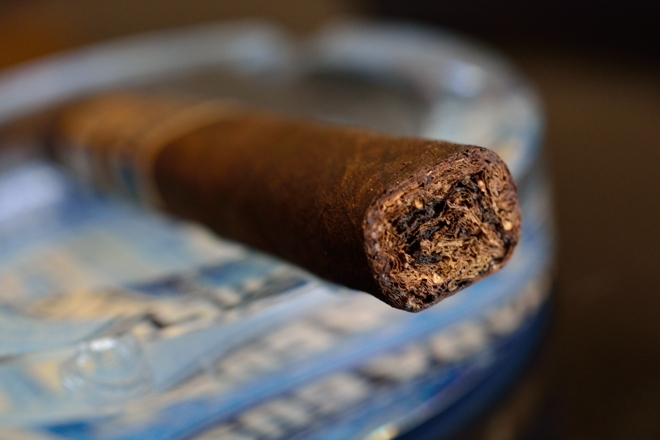 The wrapper isn’t the only thing that’s dense, the whole cigar feels incredible thick and heavy. I’m not too worried about over-handling this one. 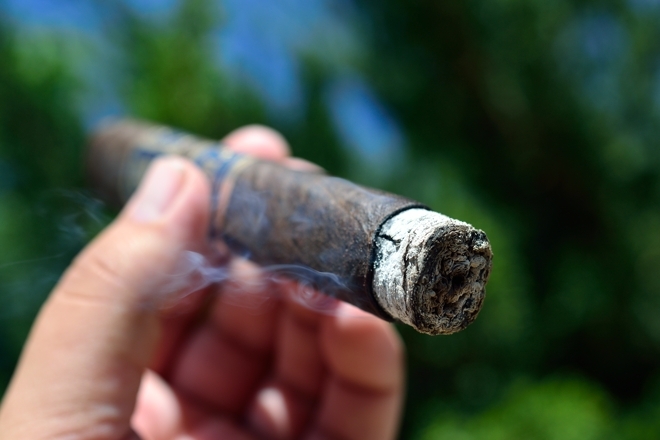 There are a few medium sized veins running through the body of the cigar up to its round, double cap. The soft box press format on the Dogma make in not only very comfortable in hand, but it also has a great mouthfeel. 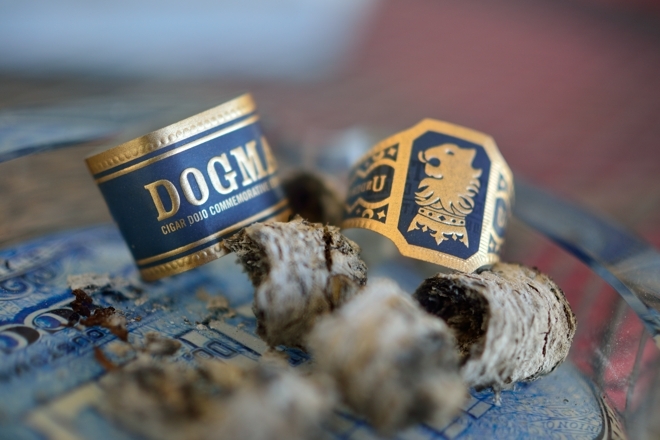 The Undercrown Dogma is polished off with the standard blue and gold Undercrown band with the addition of the secondary band with the words “Dogma” and Cigar Dojo’s “Never Smoke Alone” tagline and logo. The wrapper on the Undercrown Dogma gives off a coffee, chocolate, and tart aroma while the foot of the cigar lets loose a ton of spice and cedar. The cap cup clean and easily using my double bladed Palio cutter. The cold draw was a bit tight, but produces some really strong spice and cedar flavors with some natural tobacco mixed in. 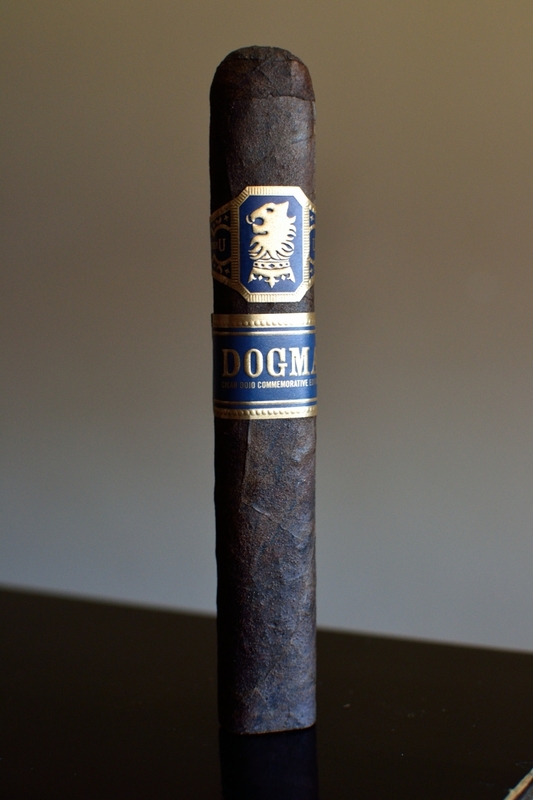 First Smoke: The Undercrown Dogma starts out with a nice black pepper boom. I was surprised at just how quickly the pepper dropped out of the smoke. The rest of the flavor profile lead off with some real bold cedar, sweetness, cherry, tobacco, and spice. After about an inch the black pepper re-appeared, and would continue to poke its head in then dissipate. The draw is incredible. Every tiny puff kicks out massive clouds of thick shite smoke. The amount of smoke pouring out of this cigar as it rests in my ashtray is incredible. The burnline is a bit thick, but dead even leaving behind a very thick, tightly compacted white ash. The ash held on for an inch and a half before falling into my ashtray. Halfway There: The pepper has completely faded from the experience in the second third of the Undercrown Dogma. What I have left is still a very bold cedar, some great sweetness, spice, black cherry, chocolate, and tobacco. The cherry and spice make for a really interesting combo and I tend to pick these two flavors quite often with the Undercrown and the Liga Privada No.9 blends. The retrohale is real spicy with sharp cedar notes and a ton of sweetness. I am not feeling any nicotine what so ever as I close out the second third with a flawless burnline. Finish: It took me almost 2 hours to take down the Undercrown Dogma. 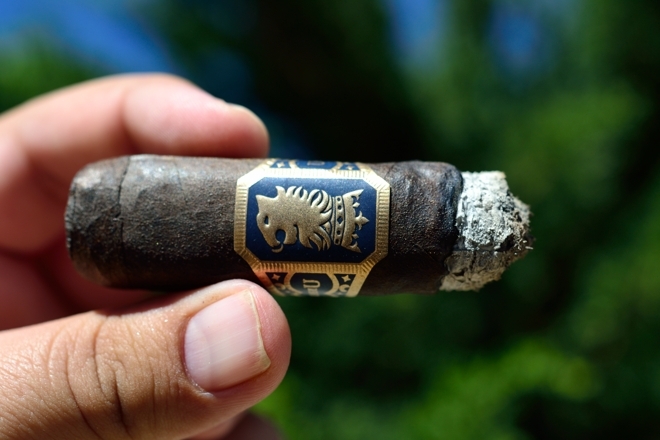 The Undercrown series aren’t the quickest burning cigars, but this one took considerably longer to smoke down than the other formats I smoked. Some awesome floral flavors have started to creep their way into the flavor profile during the final third. Along with the floral was a ramp up in spice while the cedar and chocolate remained in the mix and the cherry and sweetness have dropped out. It’s been an interesting experience. The final inch finished clean and smooth with no harshness or heat built up. I am only feeling a very slight nicotine kick as I put the Dogma to rest. Overview: I’ve always been a fan of the Undercrown Series. Being a Liga Privada fan, it’s a great little departure from the line that is easier on the budget and far more easy to find in shops around the world at any given time. When they added the Undercrown Viva to the line I was enthralled. A stronger Undercrown? Sold! And now, they offer it in a larger, longer boxpress form. I think it’s a wonderful cigar, with a great format. I do however think the Viva had more of this crazy sweetness that I don’t tend to get in any of the other Undercrowns. This sweetness is also picked up in the Dirty Rat. I had a conversation with Steve Saka about this in Nicaragua and he alluded to the Nicaraguan Viso that they use in those blends. Either way, it’s one of the main reason why I love those blends so much and for whatever reason I didn’t pick up nearly as much of it in the Dogma. It’s probably due to the wider format. Outside of that, this cigar still rocks. I’d probably choose it over the other Undercrown series with the exception of the Viva. The price is more than reasonable and the fact that they are offered in 10 count bundles make it an easy decision. I can see why these sold out so quickly, and highly encourage you to get your hands on them during their next batch. Pairing: Want to see a perfect pairing? This is it. Founders KBS, or Kentucky Bourbon Stout is a Bourbon and Coffee flavored stout that is widely sought after by every beer enthusiast across the united states. It’s basically beer happiness in a bottle and by far one of the best stouts I have ever had in my life. Coming in at 11.2% ABV this heavy stout leads off with tons of bourbon, coffee, and chocolate with a ton of spice and cinnamon finishing off with a heavy cream and caramel. It basically tastes like Irish Cream in beer format. 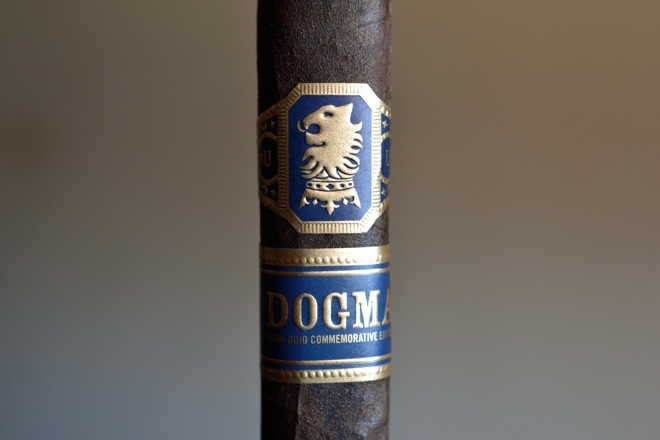 The spice, coffee, and chocolate paired up amazingly with the flavors in the Dogma, leaving a nice, creamy, bourbon overtone. I could drink and smoke this pairing all day. Sounds like a great smoke, but I think I’ll stick with the Viva from a cost and availability (and preferred size) standpoint. LOL, another beer I don’t think I can get locally. Sounds like a nice dessert. Nice combo. The KBS made me envious. My mouth is watering here at work thinking about the brew now 🙂 thanks for the read!